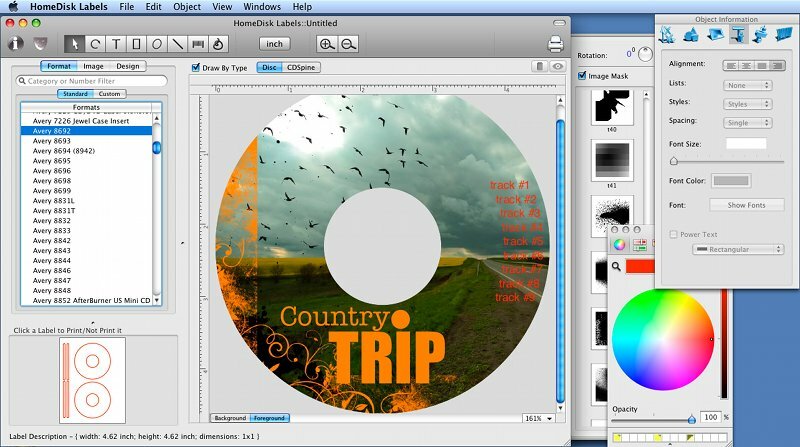 The Home Disc Label is a CD/DVD disc label designer that helps you to create CD/DVD labels using various built-in label formats, clipart images, and layouts provided. Various objects, like text, graphics and images can be easely added to your documents. Numerous image effects, like opacity level and image mask, in combination with other settings allow you to make visually stunning effects. The image libraries used for either label background or image objects along with the predefined layouts simplify the disc label creation process greatly, making it possible to finish the work in three steps: - Selecting label format, - Selecting background, and - Selecting Layout and typing in the necessary text. Main Features: - Import playlists lists from iTunes, Finder, and Text File - Start with a pre-designed template, or create your own - Templates for jewel case and DVD case inserts and booklets, MiniCD, and other media - Print to a wide array of label and paper types - Include and edit multi-line text laid out in a circle - Wrap text around other objects and around label edges - Include and edit multi-line text laid out in a circle - Numerous image effects, like opacity level, image mask, etc - Barcode generator - support add barcode to label. - Support insert table to label. - Support save your label as a CD Label Maker document, or as a PDF, TIFF, Postcript file. - Works with a variety of disc sizes and shapes. - Very easy to use, anyone can use it.